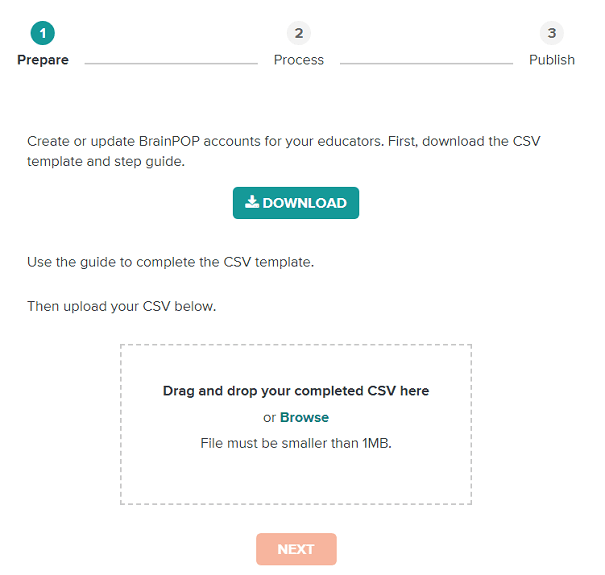 My BrainPOP district administrators can create individual My BrainPOP accounts for educators or upload educators in bulk via CSV using the District Admin Dashboard. Fill out the form with the educator’s username, first and last name, Educator ID and email address. You can then click the drop down menu to select the school the teacher should belong to. To add a teacher to multiple schools, click + Add another school. If this teacher should also have administrator privileges with access to the District Admin Dashboard, check the box that reads ‘Educator is an admin and can create and upload educator and student accounts and view usage data’. Click Create Account. After educator accounts are created, educators will get an email with a link to confirm their accounts and choose their passwords. (Be sure educators check their spam folders or add mybrainpop@brainpop.com to their trusted senders.) After confirming, they will be able to create their classes and have students join them. When adding multiple accounts, we recommend uploading in bulk via CSV. You will then be asked to give each school within your district a School ID that is unique within the district if it's not set up. You will populate the School ID column in your CSV file to correspond with the school of each teacher you upload. 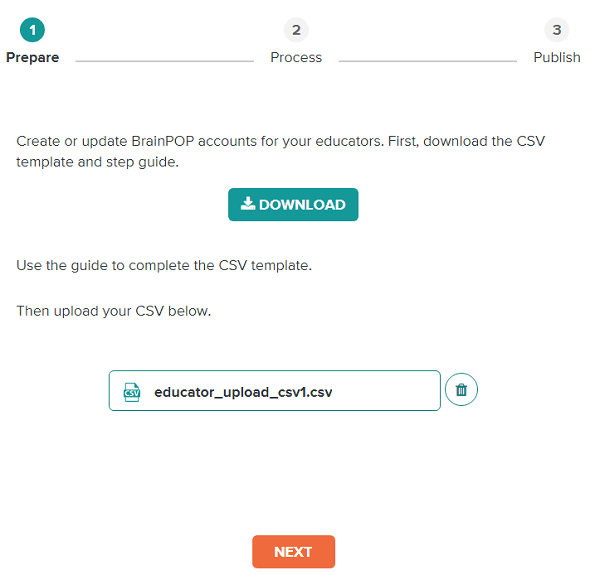 Open the CSV template and prepare the CSV for the educators you wish to upload. First and last name First and last name of the educator. Educator ID A unique ID within your district. This can be any characters or numbers. We suggest using a persistent identifier you use year to year. If you use a Student Information System, this could be your teacher’s unique ID in that system. School ID The unique school ID you assigned to each school in your district. You will use this ID to assign teachers to their corresponding buildings in your district. Click Back to Upload to upload the CSV. Choose Next. 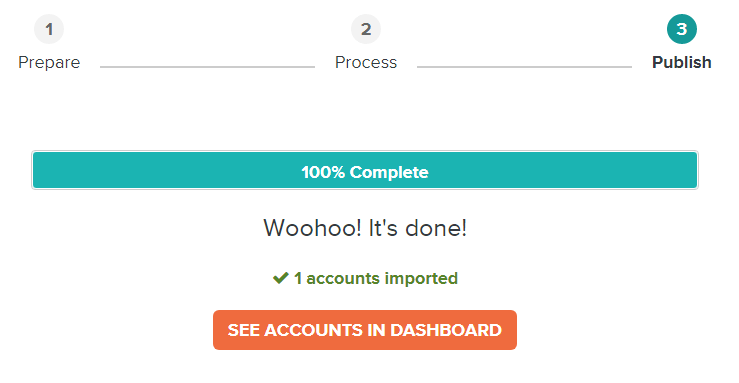 If accounts have no errors, click Woo hoo! Import Accounts to continue. After educator accounts are created, educators will get an email with a link to confirm their accounts and choose their passwords. (Be sure educators check their spam folders or add mybrainpop@brainpop.com to their trusted senders.) After confirming, they will be able to create their classes and have students join them. For more information about setting up and joining classes, see our Create Classes article in our Help Center. 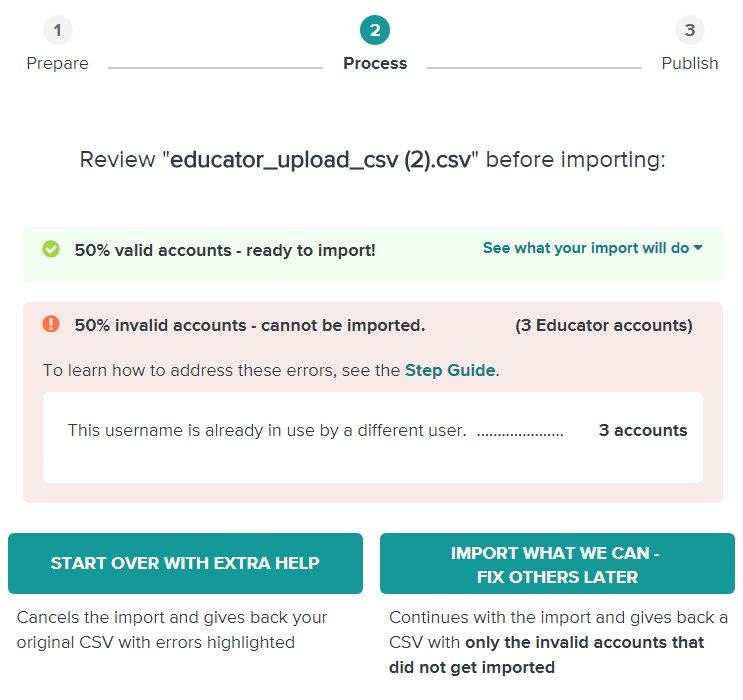 You can only import one CSV per account type (educator vs. student) at a time. 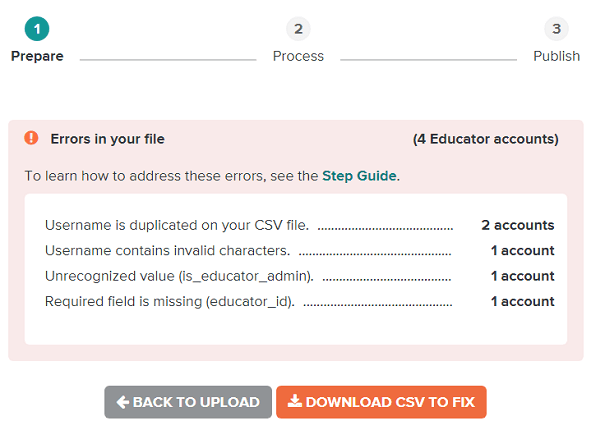 If you import a second CSV of educators while the first is still being completed, the second will be queued and begin after the first CSV completes. Can I add a teacher to multiple schools? If a teacher has an existing educator account, you can choose + Add Educators, and then Does an educator already have an account? This will allow you to send an email inviting the teacher to join the school, at which point they will have the option to switch and leave their original school, or add on the other school. 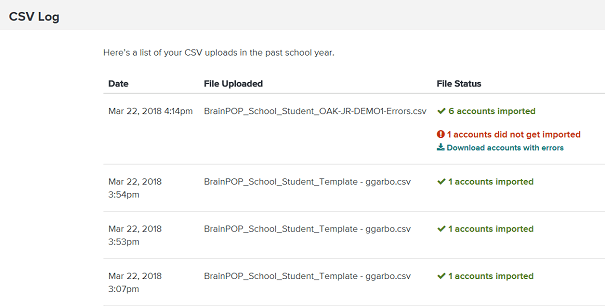 When uploading the CSV file, you can include the educator’s information (username, name, email, and educator ID) to add them to a school. The educator will have the option to be linked to both schools, or move from one school to another. No. Uploads will continue until complete. 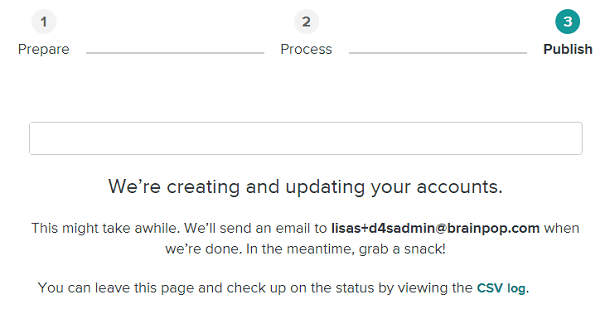 You will be able to make changes to accounts once the upload is finished.